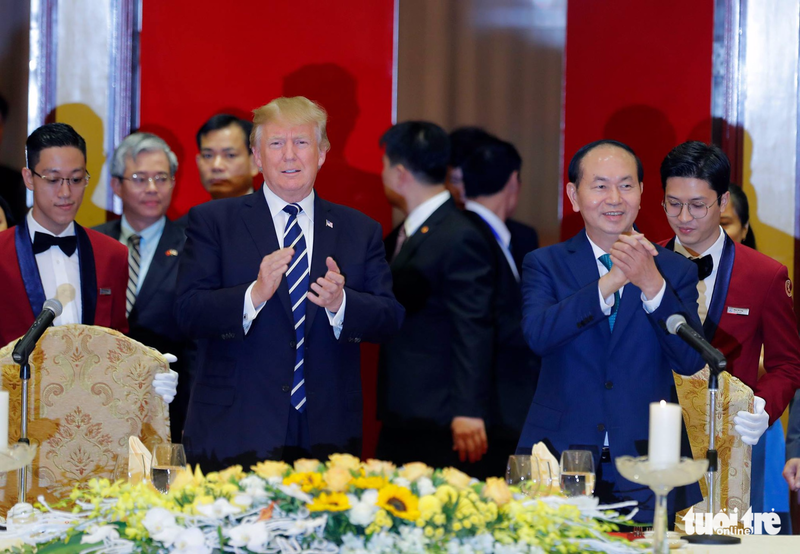 Vietnamese and U.S. companies on Sunday signed memorandums of understanding on gas development, automobiles, as well as aircraft engine purchase and support during U.S. President Donald Trump’s visit to Vietnam. PetroVietnam Gas GAS.HM and AES Corp signed a memorandum of understanding on Son My liquefied natural gas terminal project and an MoU with Alaska Gasline Development Corp on gas supply and upstream investment. Pratt & Whitney Co signed an engine purchase support agreement and binding MoU for the sale and maintenance of its engines with Vietnamese flag carrier Vietnam Airlines. The U.S. engine maker also signed a purchase and support agreement for 20 engines with Vietjet Aviation JSC. U.S truck maker Navistar International Corp signed an MoU on commercial truck business with Vietnamese Hoang Huy Joint Stock Co.
No details were available on the value of the deals, which were signed in the presence of Trump and his Vietnamese counterpart Tran Dai Quang.